Siamese conjoined twins they were in concrete and stone, in flesh and blood, the Trumpian fleapit and the Trumpian new house of horrors, the one I transferred to following my disaffection with the Trumpian fleapit. The Trumpian new house of horrors was a stultiloquent sarcophagus, a familiar nightmare and freak-show face, a morbid reminder of the starchy wickedness of the ruthless character assassin, my erstwhile manager, the Manager. The Trumpian new house of horrors, it was as if I’d been disentombed and reburied in the same vile fleapit sarcophagus. It was no lover’s tiff, the noisome romantic syzygy linking the Trumpian new house of horrors and the Trumpian fleapit. It was the mawkish polemic of decaying, ludic death in the open wound of the sinking romantic syzygy―rather. Death, she meticulously etched into the os fontale of her epitaphic wicked ways. “Vivisepulture!” I wrote on her tombstone. Oh, the emotional tabescence of ludic death in the wicked hearts of men! The polemic of this decaying, ludic death stank to high heaven in the vile Trumpian fleapit sarcophagus, so it actually was in the deep state of the Trumpian new house of horrors. That stinking death of her nymphic professionalism closely resembled life somewhat, life that looked deceptively and unpersuasively and eerily scary as death stank even more. Death, that charming colloquialism for Trumpian schizophrenia for which I felt no clinical nostalgia, insidiously blended into the primordial soup of life’s clinical depression and anxiety disorder. That bathetic death, of the criminal psychology of life, was the criminal mastermind behind the charismatic spontaneous generation of mental illness. For her, unlike me, life was a shifting rhythm of stupendous fraud, death an immaculate certainty of virginal promiscuity. My, oh, my, and you always wondered why the dangerously wicked lived forever while the good, the benevolent, and the dangerously generous, God herself, passed out of existence as soon as she was born! Look at Martin Luther King, Jr! How could the great Rolihlahla Madiba and Kwame Nkrumah die so young? How could I’ve passed out of existence so young merely trying to get the attention of and, if possible, marry the Methuselah-like hollow-circle of an American Dream that was also impeccably nightmarish? Is the Methuselah-like hollow-cycle of my endless deaths and psycho-emotional decay my portion in life? My my my never-ending suffering chasing after the elusive American Dream! Could I ever have sung Johnny Gill’s “My My My” to ease the socially constructed etiopathogenic burden of my wounded soul when I was surrounded on all sides by the vapor canopy of sentimental funereal hymns, in opposition to the philosophic and moral and existential truths in Bob Marley’s “Concrete Jungle” and “Talking Blues” and “Burning and Looting” and “War” and “So Much Trouble in The World”? Of Africa, wept Wole Soyinka in the wilderness. Of “Mama Africa,” screamed Peter Tosh in the beautiful orchard of existential possibilities. Of “One Love,” screeched Bob Marley at the shameless ears of incorrigible racists and xenophobes and nativists and misanthropes. Of The Wretched of the Erath, Frantz Fanon’s liberating philosophy for the oppressed. Of Things Fall Apart, Chinua Achebe bid farewell to Joseph Conrad’s Heart of Darkness. Why leave out the attention-grabbing, touching refrains―those great, non-lugubrious foods for the soul? Much as the Trumpian new house of horrors tried to sing this sepulchral anthem about human suffering and redemption to awaken and free the living dead from the endarkened wheel of life, the broken vocal register of the Trumpian fleapit insidiously got in the way of the deceptive comfort of the Trumpian new house of horrors and stifled the little progress that had been made toward reaching that evocative height of emotive crescendo required to bring about a veneer of placidity in the troubled hearts and souls of many an individual who worked in the Trumpian new house of horrors. Both the Trumpian fleapit and the Trumpian new house of horrors spoke this dreadfully sophisticated, powerful language of Mario Puzo’s The Godfather where the concept of omerta, meaning a conspiracy of silence, primarily drove the circumvolutory character of my self-talk. It was ultimately omerta that secretly exposed Donald Trump, a flagitious political clown who occupied the White House of the Trumpian fleapit at one point, as reportedly calling the great black soul of the African world the S-word. “This drama queen who once occupied the White House of the Trumpian fleapit obviously spoke through his S-word proboscis when he opened the floodgates of his diarrheic verbal assaults on the dignity of Africa, the autochthonous home of his ancestors,” a white friend of mine―known for his outlandish sense of humor and signature charisma of vicious sarcasms―told me. 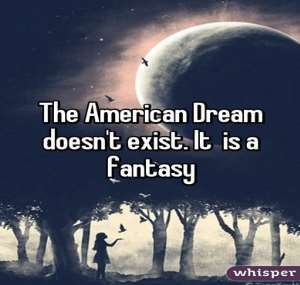 The American Dream therefore embedded the consubstantiality of the Trumpian fleapit, the Trumpian new house of horrors, and the S-word in the metarealism of Trumpian kakotopia. The question then became, how and where exactly do I locate Kurt Goldstein’s and Abraham Maslow’s Holy Grail of self-actualization if in fact it was buried somewhere deep in the social-political sarcophagus of the stygian American Dream―actually beyond the uncarnate taction of human kindness? Isn’t the self in self-actualization the other on the problematic hierarchical scale of America’s racialized ecology? The fabled illogic of philosophic ostentation, that is, all these privileged and elitist pious platitudes about the ersatz graffiti of the American Dream were much ado about nothing. I need my wings. And therefore, I need them with me quickly. What? Feathery wings! I need my feathery wings to help me fly away, à savoir soar away from the claustrophobic narrowness of the Faustian American mind, higher and ever higher, further and ever further, from the anthropogenic-driven gravitational pull and sinking ship of social injustice in the American body politic. Was I a rat then to behave like other rats abandoning a sinking ship carrying the American Dream? Whoever is in charge of my destiny murdered it in the heat of cold blood first, before skillfully fabricating it into a monstrous maid of honor, and then stealthily insinuating it into the marriage ceremony of my mother’s egg and father’s sperm, no doubt. Such had been the plaintive commentary on my Faustian destiny in the diseased uterus of the American Dream, in the S-word of Trumpian America! It usually was the mundane funereal jeremiad that scrupulously followed the complex narrative of the immigrant experience to its logical monomythic conclusion, of the bottomless grave of unimaginable suffering, a grave of suffering cyclicality―where the hardworking, law-abiding immigrant was banished to the emotional gutters and ghettoes of otherism. My tsoris only intensified in the S-word of Trumpian America! Yet the story of the immigrant experience is the heart and soul of the American body politic, the only dramatic structure of the American experience. Thus the noble immigrant, whether a bold statement of crushing failure or of Bunyanesque success―represents the only narrative thread and singular hero of the American experiment. This level of blatant insensitivity on Trump’s part, his masterful dabbling in the art of casuistry, ran counter to the pedantic aesthetics and narrative harmony of string cosmologist Stephon Alexander’s The Jazz of Physics: The Secret Link Between Music and the Structure of the Universe and Yusef A. Lateef’s Repository of Scales and Melodic Patterns, but, as it turned out, the highly complex harmonic idiom and discarnate humility of jazz as the Godhead of human creativity, together with its accompanying peaceful ensemble orchestration of the inner workings of the mind and ever-flowing wealth of instrumental coordination from the acquired technical arsenal of improvisational arrangements, seemed to have made no lasting, discernible impact on the structural inhumanity and faulty organizational conscience of the Trumpian new house of horrors and the Trumpian fleapit. I know, I know now, of course, that the endarkened soul of the American body politic―largely born of an ignorable Trumpian intellectual mischief and political lies―had systemically alchemized my stillborn destiny into a conniving doppelganger of diablerie while in hot pursuit of prestidigitator Trump’s American Dream. It was that strange Trumpian new house of horrors, another maculate temple erected upon a tottering foundation of mindless wickedness, where my colleagues’ behavior gave meaning to alternative facts before the advent of the non-pussyfooting Trump―and where the dangerous rhetoric of Trumpian right-wing populism and the genocidal lies of Columbian proportions took root almost everywhere. Trump, a pantheistic effigy from the radical right, appeared everywhere before his ideological and political parturition. Grandiose narcissist Trump, unbeknownst to the declining carnality of America, had been the immanent heart and soul and blood and spirit of the body politic of America preceding, during and following the founding of the US in both the Trumpian fleapit and the Trumpian new house of horrors, now only rearing its ugly head publicly for the first time. Trump was Christopher Columbus in disguise. Bandy Lee’s The Dangerous Case of Donald Trump: 27 Psychiatrists and Mental Health Experts Assess a President merely scratched the surface of a deeply troubled elitist psychology in full operation in the Trumpian fleapit and the Trumpian new house of horrors. The Trumpian new house of horrors in particular closely resembled one of the apartments I lived in in New York. Two of the four tenants I shared the same floor with always found themselves embroiled in one pettifoggery after another, with one getting up in the dead of night and defecating in the bathroom sink, and then buttering the kitchen sink and bathroom floor and tub with spatters of fresh feces, just to spite his enemy in a mortal battle I’d no investment and interest in. The other co-tenants and I became collateral victims in a senseless war of words and physical confrontations involving pedomorphic humanoids. Never mind that they were not children. One was a retired teacher, the other a fifty-something chef. The oppressive psychology of the Trumpian fleapit, and now of the Trumpian new house of horrors in particular, turned me into both a direct victim and a subject of vicarious victimization. I consistently have wondered how Native Americans and African Americans managed to survive centuries of the brutality of white supremacy. What would cause American publishers to turn the Shakespearean character Othello, a black African, into a white man in American editions of the same title? How did Nelson Mandela survive the tuberculosis with which the Apartheid State of South Africa reportedly infected him while incarcerated? How did Lupita Nyong’o’s queenly, gracious blackness assume a celebrated state of whiteness on the cover of a mainstream white magazine―Vanity Fair? How did the ancient Ethiopian princess Andromeda become white in Clash of the Titans? How exactly did eighteenth-century virtuosic classical composer, violinist, and first-rate fencer, Joseph Bologne Chevalier de Saint-Georges, one of Europe’s and humanity’s best, transition to Black Mozart? As if there ever existed a White Joseph Bologne in the imagination of man! “It seems that a black man simply cannot be deemed exceptionally gifted independent of the ready, uncritical evocation of the purported higher thinking powers of the white man as a reference page for his privileged intellect and remarkable sense of bodily-kinesthetic finesse,” to paraphrase one of my white professors. And finally, how do we convincingly account for the resilience of Native Americans and African Americans―in other words, of my own resilience from the point of view of the never-ending excruciating experiences I found myself forcibly identifying with in the Trumpian fleapit and the Trumpian new house of horrors, as well as in the S-word of Trump’s America? I was no daydreaming fantasist or John-a-dreams to ignore this important question for the sake of my mental and emotional health. Converting Toni Morrison’s The Bluest Eye into the quintessential soul of Bob Marley’s “Blackman Redemption” was no easy undertaking, but I was under no illusion that this was unrealizable. I nevertheless pushed ahead in life in hopes of making this seemingly unrealizable task possible. And now they, the new schemers nominally in charge of the rump state of the Trumpian new house of horrors, deemed it fit to take issue with the object of my morbid obsession, the aesthetics of death, as I thoroughly weighed the question of my psychological resilience quite apart from the entangling web of normative moral dilemmas that beleaguered Rodion Raskolnikov’s conscience after committing a heinous murder―according to Fyodor Dostoevsky’s Crime and Punishment. Crime really doesn’t pay. Forging on in life in spite of all odds radically called for the vigorous pursuit of resilience in my special case, perhaps a progressive path to self-actualization―that is, embarking on a path to sustaining one’s potentiality and emotional development. Furthermore, and perhaps most importantly, I’d seen myself in the existential insights the aforementioned questions raised for the particular context of my harrowing experiences in America. Couldn’t I be comfortable as a virtuosic classical composer, violinist, and first-rate fencer in the investiture of my biological blackness? How do I overcome my posttraumatic slave syndrome as a vicarious statement of racial solidarity with African Americans? How do I sustain my resilience in the face of persistent racial discrimination? How do I incorporate victorious consciousness into my recovery? How do I overcome the tuberculoid racism Mandela was reportedly exposed to in absolute secrecy? How do I maintain my Othello and Nyong’o blackness against the hegemonic canvas of whiteness? How do I survive the deadly cancer of white supremacy which has been plaguing Native Americans and African Americans in the past five centuries? Jonathan Kozol’s The Shame of the Nation: The Restoration of Apartheid Schooling in America objectively negated the false dichotomy between the American South and the American North, more specifically between the Trumpian new house of horrors and the Trumpian fleapit. This shared sense of false dichotomy widely celebrated among liberals and progressives negatively impacted the moral health of the American body politic. And, as far as my general health is concerned, the concept of immigrant paradox made no sense to me whatsoever. My mythic self-talk in the Trumpian new house of horrors eventually debunked this grandiose theory―leaving the Trumpian new house of horrors nothing to boast about insofar as the sweeping lies concocted about immigrants is concerned. What has democracy come to? Democracy is surely on the verge of unsalvageable extinction if Trump, a Columbian incarnate, could become the accidental caretaker of the White House of the Trumpian new house of horrors and the Trumpian fleapit. It is absolutely not democracy if my six-sided white coffin could be made to fit into the graveyard of the American South with surgical precision. Of course democracy exists only in name, for it doesn’t exist anywhere in practice as a matter of fact. How, then, can it slide into the ditch of unsalvageable extinction if it doesn’t exist? Was Trump one of the vultures, the adope, the masquerade, the coffin running around, or the Mr. Brown of Bob Marley’s “Mr. Brown,” a Lee Scratch-produced creepy track? This strange Trumpian Americanism in the Trumpian fleapit and the Trumpian new house of horrors!